1979: Guiding Light's Rita found out she was pregnant. 1993: General Hospital's Luke and Laura visited Bill Eckert. 2004: Days of our Lives' Abby reunited with Jennifer. 2008: ABC aired the 10,000th episode of All My Children. 1957: On The Edge of Night, Mike Karr (John Larkin) devised a plan to trick Irene into leading the police to Mary. 1965: On Days of our Lives, Julie Olson (Charla Doherty) paid a visit to her aunt, Marie Horton. Craig Merritt also visited Marie, his future daughter-in-law. Julie's father, Ben, had a fight with her lawyer and uncle, Mickey (John Clarke), over a case concerning a fur Julie allegedly stole. Craig's son, Tony, called Marie from Boston, but chose not to tell her that something was wrong. 1968: On The Doctors, the wedding of Dr. Nick Bellini (Gerald Gordon) and Dr. Althea Davis (Elizabeth Hubbard)--started on the previous episode--concluded. 1971: On The Doctors, Matt Powers (James Pritchett) promised Steve Aldrich (David O'Brien) he would be there for Carolee and the baby. 1979: On The Edge of Night, the crew prepared to shoot the last two scenes of Mansion of the Damned. 1979: On As the World Turns, Matt and Melinda walked in on the party Betsy (Suzanne Davidson) had while Kim was away at The Willows. 1979: On Guiding Light, Rita Bauer (Lenore Kasdorf) was surprised to learn she was pregnant. 1981: On Another World, Clarice Ewing (Gail Brown) told Larry she had been raped by Jerry Grove (Paul Tinder). Later, Captain Petroni (Kelly Fitzpatrick) told Jerry he was being booked for the crime. 1981: Jim Poyner aired for the final time as Dennis on Texas. He would reprise the role during Another World's 25th anniversary week (May 22-23, 1989). 1985: On General Hospital, Anna (Finola Hughes) and Robert (Tristan Rogers) continued to search for Robin (Kimberly McCullough), who was in the Asian Quarter. 1990: On The Young and the Restless, Danny Romalotti's (Michael Damian) cocaine possession trial ended with a "not guilty" verdict. 1992: David Oliver, who played Perry Hutchins on Another World in the mid-1980s, died at the age of 30. 1993: Jaime Lyn Bauer debuted as Laura Horton on Days of our Lives. 1993: On General Hospital, Sly took Lucky back to the lighthouse where Lucky met Bill Eckert (Anthony Geary) and learned that he and Sly were related. When Bill tried to call the police, Lucky ran off. Bill went to Ruby, demanding a meeting with Luke. Ruby saw Luke and Laura (Genie Francis) and told them about Bill wanting to see them about Lucky. Luke and Laura met with Bill. 1994: As the World Turns Emmy winner Martha Byrne married Michael McMahon. 2001: On The Bold and the Beautiful, Stephanie's (Susan Flannery) doctor told her Eric could not be Ridge's father. 2003: Actor Jonathan Brandis, who played Kevin on One Life to Live when he was six years old, died at age 27 after hanging himself in his Los Angeles apartment. 2004: Actor Norman Rose died at age 87. His soap roles in Marcus Polk in One Life to Live and Alex Gura in The Edge of Night. 2004: Ashley Benson debuted as Abigail Deveraux on Days of our Lives. 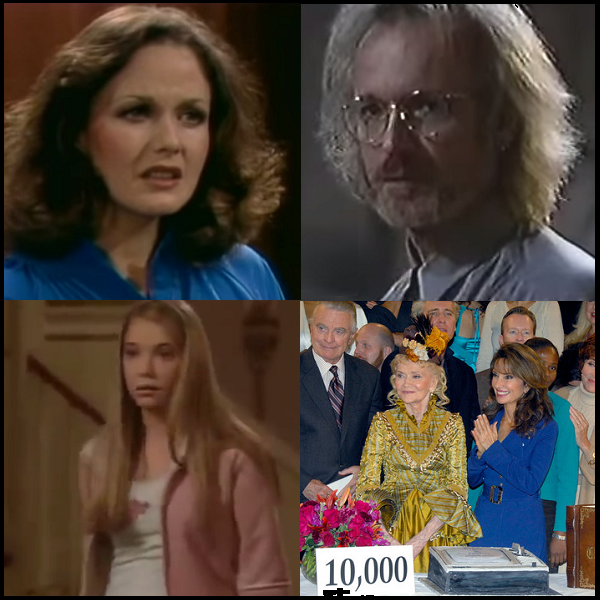 2008: All My Children celebrated its 10,000th episode with a special appearance by Agnes Nixon and a tribute to Myrtle Fargate (Eileen Herlie). 2008: Actor Keith Pruitt died at age 47. His soap roles included Frank Wendall in As the World Turns and Flynn Reilly on Loving. Actress Louan Gideon (Liza on Search for Tomorrow) would have also celebrated a birthday today. She passed away in February 2014 after a long battle with cancer.